Shuto Con is fast becoming my favorite convention. 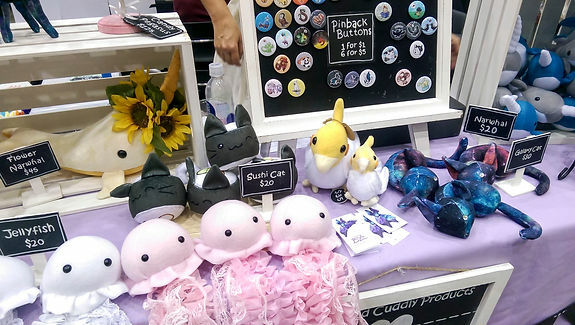 Though I’ve only attended for two years now, the artist friendly focus and laid back atmosphere make it an extremely pleasant convention while the attendance is still high enough that there’s always something to do. Shuto Con's sign up this year was juried with a short application window. I had absolutely no issues with sign up, though the short window may be a problem for some. I recommend joining the Shuto Con Artists facebook group to make sure you don’t miss important updates. Shuto Con does have some strict rules in place, but none that seem unreasonable. The major rules that stand out to me at Shuto Con are the 50/50 rule (No more than 50% fanart), the banned list of intellectual properties, and the new restrictions on displays. This year displays could not be over 8 feet from floor to the top of the display and no merchandise could be displayed behind the booth. These restrictions are mostly for practical and safety reasons, but those will larger displays will want to measure them before attending to make sure they will fit. They are actually very strict on their 50/50 rule and will go around and check each table on the first day of the con. I would encourage potential artists to bring more original art than fan art not only to avoid getting in trouble, but also for your own benefit. This is a really good convention to start building a fan base for your original ideas. Original work really had the ability to shine here with less competition from fan art. Not only do staff members quickly respond to emails, but they actively frequent the facebook page, official Shuto con group, and the Shuto Con Artists group. It’s fast and easy to get a response to a question. Staff is polite and personable, which makes it very easy to talk to them. I received an email with all the set up information including times and locations 2 weeks before the convention. One thing I would have appreciated is a map or layout of the convention hall, including the location of the loading dock and a mark where the entrance to the parking below the convention hall is. Even a written description would have been nice. Even though this is my second year, I carried my stuff from my hotel room the first year, so this was all new to me. I spent about 20 minutes trying to find the entrance to the parking ramp under the convention center and then trying to find the right loading dock (which I never found). As I said, I could not find the loading dock (I feel very bad at finding things), but it turned out just fine. We parked under the convention center and moved our items in by taking the elevator up to the second floor and to the front of Hall A which was just across the hall. It was quick and easy and I appreciated how close Hall A was to the parking. I was worried about using my cart to move things as the convention hall rules say it isn’t allowed (I like to check the hall’s specific rules so I don’t miss one the convention forgot to mention), but I passed at least one convention center employee and they didn’t say anything about it. It was one of the fastest and easiest set ups I’ve done so far. There was no wait to move my stuff in, no wait to get my badge, and everything went smoothly. As I said in the beginning, Shuto Con is one of my favorite conventions. I feel like they genuinely care about artists there. There is always security walking around and staff easily available if needed. Stefanie, the AA head even came to each table personally and asked for any feedback or if we had any questions. It’s always a nice touch when conventions do that because it’s often hard to get a hold of staff afterwards if you had issues. The hours were very thoughtful, there were no days longer than 8 hours and no opening times that required me to be up before 8am, which I appreciated. It is very difficult to work conventions with 10-14 hour long days, 3 days in a row. There’s no time to eat, sleep, or enjoy the convention you paid to attend. Shuto’s hours allowed plenty of time for artists to get a nice, hot meal or even enjoy a few hours of the con before bed if they wanted to. Another way they put artists first is by making the artist alley just as large as the dealer’s hall and placing the alley in front of the entrance doors so attendees must walk through artists to get to the dealer’s. I think this resulted in better exposure for the artists. I also feel like attendees spent more time at each individual booth. I think the mix of fan art and traditional art meant people had to spend a bit longer to find their favorite items rather than scanning quickly for their favorite characters. I think the layout of the tables was superb as well. There is just enough space between the tables to walk between them, but not enough that attendees were trying to walk through the tables. Though the tables are back to back, there was enough room to store your stuff and even have a little walkway for other artists moving in and out of the space. Sales at Shuto Con went well for me. Though I was low on stock due to a combination of illness and working on my Kickstarter, I still managed pretty good numbers and sold exactly 75% of the stock I brought. My sales numbers were actually very similar to Youmacon even though Shuto is more than half the size. Though every person is obviously different and there will be exceptions, I got the impression from speaking to other artist that most people did okay at this con. No convention is perfect, but Shuto Con was about as close as I’ve experienced so far. My only complaint was the entrance to the hall. One confusing part was the badge checks. Sometimes there was staff there and sometimes there wasn’t. When there was staff there, it was difficult to get in with everyone entering being bottle necked through a single door. When there wasn’t staff there, people were just entering and exiting from any door they wanted, resulting in people on the other side getting hit. When there were staff, some people tried to ignore the staff member and go through other doors since there were so many doors to choose from. I feel like a large sign with the hours and a big closed sign for when the alley was closed would have helped, as well as a clearly marked entrance and exit door. Perhaps with the unused doors roped off. It might help cut down on the number of people still trying to enter after hours and help control traffic. I stayed on the quiet floor of the Radisson and I can confirm it really actually was quiet. There were no loud noises and aside from a few people chatting in the halls, I never heard a peep from other rooms. I really, really appreciated a quiet floor since I had to get up early every day. The food choices were great. Too many convention halls suffer from offering nothing but a single concession stand. I never felt hard pressed to find something to eat which was nice since I forgot to pack our lunches. One complaint I did have as an attendee was the panel selection. It seemed like most panels I saw were fandom themed. I attended with my mother who is into the general geek/nerd culture, but entire panel dedicated to one fandom would have been mostly lost on her. We’d have appreciated a few more generic programing options that everyone could enjoy without being familiar with the subject matter. 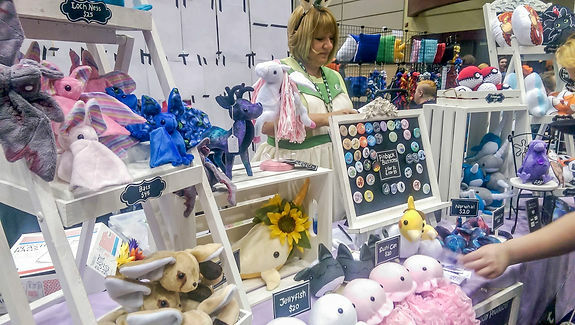 The crafting panels did all look interesting, though, I always love to see those at a con. Again, this was very simple. Though I still never found the loading dock (I feel pretty useless at finding things now), I just took my stuff through the same way I came in. Staff members even kindly held the door open for me so I could get out. Despite having to push through attendees blocking the artist alley door, it was still a fast and easy load out! 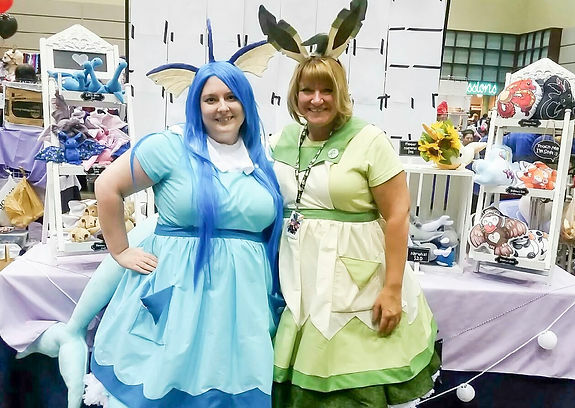 Shuto Con is a great convention with large enough attendance numbers to see good sales while still remaining small enough to offer a relaxed atmosphere. The focus on artists first puts artists in a good position for a very successful convention. This is a great convention to take a risk at and bring some new, original art. As an attendee, this convention is very laid back. It isn’t a 24 hour party con. The crowd is a bit younger and you’ll see many young teens with parents in tow, even some children which are mostly absent from larger cons. Expect some down time each day spent socializing in the halls and taking photos. I am thrilled that you enjoyed your fourth Shuto Con presentation. 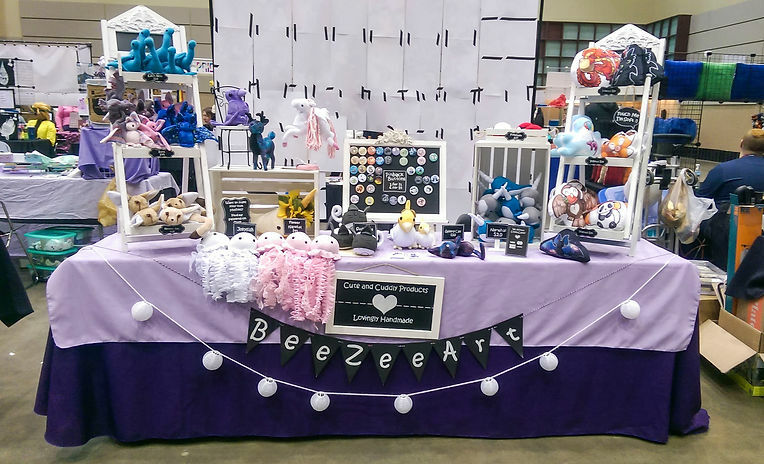 Your custom made plush animal projects are amazing!